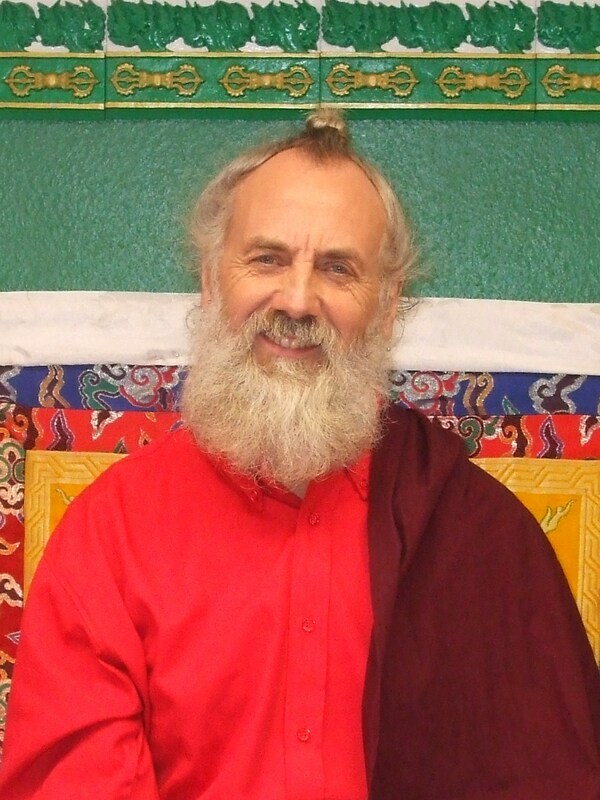 As one of Rinpoche’s senior students, Martin Boord is well known already to many people within the Khordong sangha. Visiting India and Nepal as a teenager in 1967, Martin became a devoted Buddhist and immediately embarked on the study of Sanskrit in order to read the original texts. Receiving teachings from many of the great Tibetan masters of all schools who had become settled in India following the takeover of their country by Chinese communists, he studied the doctrines of both sūtra and tantra. Over the years, he carefully surveyed the entire Buddhist Tripiṭaka with the lamas of Tibet before immersing himself fully in the guhyamantra practices of the Nyingma school under the guidance of H.H. Dudjom Rinpoche and Lama Khamtrul Yeshe Dorje, the renowned “weather man” of the Dalai Lama in Dharamsala. It was whilst on a pilgrimage with Yeshe Dorje to Sarnath in 1973 that Martin first met with the Khordong Terchen Tulku, Lama Chhimed Rigdzin, with whom he immediately began to form a close bond of attachment. Subsequently, Martin invited Lama Chhimed Rigdzin to Great Britain in order to inaugurate his new Dharma Centre, granting empowerments and teaching the Byang-gter Dorje Phurpa (Northern Treasures Vajrakīla) for the first time in the west. Later, moving from Europe back to India, this master and disciple together translated a number of Byang-gter texts, including hundreds of pages of Vajrakīla Sādhana (practice texts), which have remained the major focus of Martin’s life. Taking the Byang-gter Phurpa as his theme, Martin went on to study at the School of Oriental & African Studies at the University to London, for which he was awarded a BA in Religious Studies (Buddhism), followed by the degree of Doctor of Philosophy in 1992. 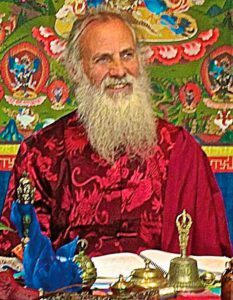 His doctoral thesis was subsequently published as The Cult of the Deity Vajrakīla, by the Institute of Buddhist Studies, Tring, 1993. Having completed his studies at SOAS, he was awarded a scholarship from the Stein-Arnold Exploration Fund which enabled him to return to India in order to research the sacred geography of Sikkim, one of the seven “hidden lands” of Rigzin Godem. This work was eventually published in the Bulletin of Tibetology. Reading Sanskrit and Tibetan languages, as well as having studied Tibetan art for many years, Martin has acted as a consultant to the Ashmolean Museum, one of the oldest public museums in Europe, helping to identify and arrange their holdings of Tibetan cultural artefacts and paintings, and he continues to work on similar projects at different times when called to do so. The British Museum, for example, requested his assistance when they were offered a collection of Tibetan phurba for purchase, about which they had no specialist knowledge, and he has collaborated with the makers of documentary films for television, etc. 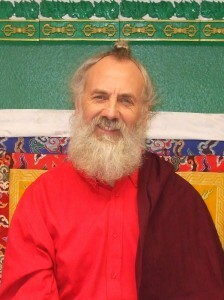 Having spent many years developing his understanding of the Dharma in meditation retreats, in 1998 Martin was invited by Lama Chhimed Rigdzin Rinpoche to accompany him as an assistant teacher on his European Dharma tour, in order to give teachings on the Deity Vajrakīla as part of the Pfauenhof retreat in Germany. This was so successful that the invitation was repeated in the following years, so that Martin again gave Vajrakīla teachings in Berlin in 1999 and he accompanied Rinpoche to Oxford, Wales and Vienna in the year 2000, where he taught many aspects of the Vajrayāna path, as well as his special subject — the deity Vajrakīla. Since then Martin has given innumerable teachings on many aspects of the Byang-gter tradition, throughout Europe and the USA. He now lives and works in Oxford, pursuing his research interests with like-minded academics and Dharma practitioners at the Oriental Institute, reading manuscripts at the Indian Institute Library and working on an ad hoc basis as Academic Visitor with those studying for doctorates in Buddhist Studies, etc. In recent years, he has completed a translation of the most illustrious commentary on Phurba practice, known as The Black 100,000 Words (Phur ‘grel ‘bum nag). This important text is a report of a group retreat that was undertaken by the three masters, Padmasambhava, Vimalamitra and Silamanju, in Nepal in the 8th century. It was transmitted in Tibet by Padmasambhava to Yeshe Tsogyal and the translation of this text is now available from edition khordong (published 2002). He has also expanded his work on the Northern Treasures texts to include further research on the Hidden Lands of Rigzin Godem, as well as the ritual cycle of the Greatly Compassionate Avalokiteśvara. His text on the Byang-gter funeral ceremonies of Avalokiteśvara will shortly become available from Wandel Verlag.